I snapped this picture this morning, hoping to catch her smiling and not cause a meltdown. Which would have been catastrophic with her sitting on the counter. All sorts of glass shards may have ensued. But, she stayed happy. She was in a good mood. For you see, my dear little miss was trying to make mommy coffee this morning. 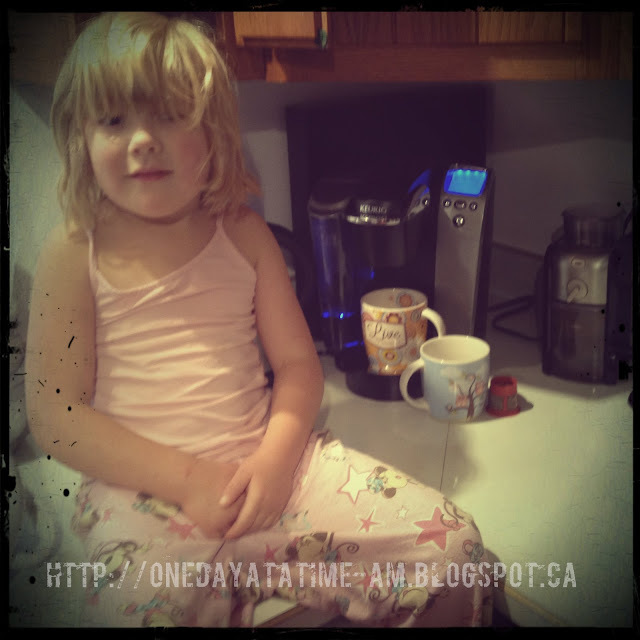 She took our coordinating mugs (that I bought this summer so that we could enjoy our "coffee" together) out of the cupboard, turned on the coffee maker and was trying to figure out how to get the coffee to go. It was the sweetest thing. Trying to make mommy coffee out of used coffee grounds. Melt my heart. Of course, less than 5 minutes later she dumped her bowl of Rice Krispies all over the table. But we'll focus on the positive today, shall we?